Joe Mascari is a leading Territory Sales Manager for Beaulieu of America, the nation's third largest carpet maker. At 91, his career spans over 60 years in the home decor industry. Service your customers, answer your phone and meet with them face-to-face. Before there was nylon fiber in carpet, before there were tufting machines, before wall-to-wall carpet was commonplace, there was Joe. Back when Warren Harding was president, Joe came on the scene and he’s not slowed down since. A few weeks ago at his home in the official “happiest place in America,” San Luis Obispo, California, and among 50 of his friends and family, Joe Mascari celebrated his 91st birthday -- but not for too long. He had to get back to his sales territory and home in Atlanta to take care of his customers who depend on him everyday. Joe is a rare find in any business, not to mention the floor covering business. He’s a humble, unpretentious man. He loves people and it shows in his eyes and easy smile. And he unfailingly puts his customers first. When asked his secret for success, he replies simply, “Service your customers, answer your phone and meet with them face-to-face.” Not terribly complicated advice. His customers love the access, and can reach Joe at home, in the evenings or on holidays to get their issues and questions answered. Today’s generation of sales professionals don’t usually work that way observed Joe, and that’s unfortunate for them, their customers and the companies they work for. Mascari was a true pioneer in the floor covering business and a carpet man thru and thru. Before getting into the floor covering business, Joe owned six appliance and furniture stores in Pittsburgh (his hometown) and Los Angeles. It was from this point that Joe began his journey in soft floor covering. First, Joe purchased a braided rug mill, sold his interest in the mill and joined E.T. Barwick Mills where he sold carpet to major accounts and distributors in a 7-state area out of California. 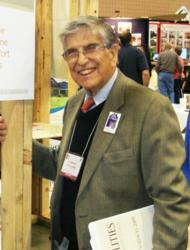 Barwick soon transferred Mascari to Atlanta as its National Sales Manager in 1961. Then after leaving Barwick, Joe and three partners purchased Modern Carpet Industries in Dalton. When Modern was sold, Joe joined Whitecrest Carpet Mills as its National Sales Manager. After Whitecrest was sold, Mascari joined Columbus Mills, which was later bought by Beaulieu. The acquisition by Beaulieu was about 15 years ago and ever since, Joe has been one of the company’s #1 sales performers. Along the way, throughout all these career stops, Joe mentored many young, up and coming floor covering executives. Many are now in leadership positions with various companies in the industry. Joe has seen it all and lived it all in the history of carpet making in America. He recalls going from single-needle tufting machines to the modern, computer-driven 800+ needle machines that are now common. He remembers manually pouring latex to make the carpet backing. He saw the advent of synthetic fibers, first nylon, then polyester. And he’s lived through the Great Depression, WWII, numerous recessions and the rise in popularity of hardwood and tile … taking it all in stride. Along the way, Joe’s had 10 children. One of them, Kristina, works with him today. We marvel at Joe, not just for his longevity and not just for his lifetime of success, but for his heart. To Joe, his job isn’t a job at all, it’s just who he is. And his heart is for helping his customers succeed. Beaulieu of America makes carpet for residential, commercial, and specialty markets. Headquartered in Dalton, Georgia, Beaulieu designs, manufactures and markets BLISS carpet for residential replacement, HOLLYTEX main street commercial carpet, BOLYU carpet for specified commercial, AQUA carpet for the hospitality industry.